Although I have some albums with Gered Mankowitz covers, including Kate Bushâ€™s â€˜Lionheartâ€™ and he is probably best know for his cover for the Rolling Stones album â€˜Between the Buttonsâ€™, his live work was something that I was largely introduced to when he had an exhibition of his Rolling Stones photos at the Proud Gallery in Camden in 2002, which coincided with the launch of his Rolling Stones 65 â€“ 67 book. Much of the book is taken with his nine-week, 48 city tour of the USA in 1965. Whilst musically I’ll always take The Beatles over the Stones, photographically I’ve always found The Stones to have been generally better photographed than The Beatles. 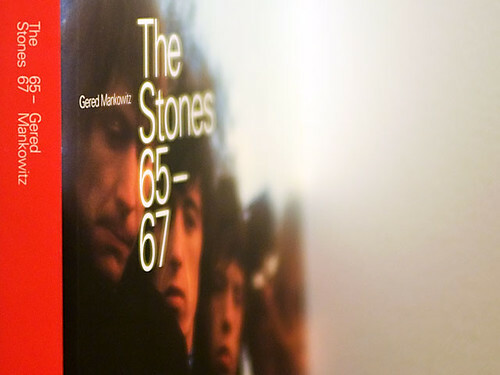 There are several things I really like about Mankowitz’s Stones photos during this period. As a photographer you canâ€™t help but be envious at the size of the tour and also the access that he was allowed, something youâ€™d almost never get in this day with a band of the Stonesâ€™s fame, even back in 1965 when they were just beginning to break in the US. Even if you did get a tour photographer job these days itâ€™s unlikely to be as long as 48 dates, and its not going to be without a whole load of restrictions, nothing like the real â€˜Access All Areasâ€™ freedom that music photographers in the 1960s and 1970s seem to have got. It could be argued that technically the photos are nothing to write home about â€“ even shooting mainly at ISO 3200 there are a lot of focus images due to slow shutter speeds in the dark venues â€“ but I think this only adds to the charm of the photos and helps place them at a time in history. I have previously written in my blog and argued in photography forums on the internet, I have no issues with blurriness or images that arenâ€™t pin sharp. If youâ€™re photographing something like car racing, the advice is usually to pan the camera to add movement, as photos of cars racing at high speed but frozen at high shutter speeds in photos make for a dull set of photos. So I see no difference when capturing the energy and movement of a band on stage or a highly excited crowd; blur from movement adds so much more to the overall effect. Finally, thereâ€™s such a sense of history looking at the photos; the fresh faced Stones, the fashion of the band and the audience and, most importantly, the sense of being in the right time at the right place to capture the madness as the Stones suddenly hit the big time in the US. Itâ€™s quite a unique situation and itâ€™s what every music photographer dreams about. Thereâ€™s a video podcast of Gered talking about his work at The Morrison Hotel Gallery here. This entry was posted on Tuesday, June 3rd, 2008 at 12:26 am. It is filed under Music Photography and tagged with 1965, 1967, Between the Buttons, Concert, Gered Mankowitz, Justin Edwards, Masters of Music Photography, podcast, Rolling Stones, tour, USA, www.notaphoto.com. You can follow any responses to this entry through the RSS 2.0 feed.